Lake Central High School (St. John) defeated Oliver P. Morton High School (Hammond) 75-46 to claim the school’s 11th Sectional Championship in Northwest Indiana. For the Indians, it was the realization of a goal they set when they first took the court back in November. Hobbs ran his team’s offense all season, growing as bold a player and a leader on the court. He’s like a show director who always oversees what everyone else is doing. Hobbs gets his piece of the net after the game. “I’m only a sophomore, so I’ve got two more years of this. Hopefully we can get back here,” Hobbs said. As a freshman, Hobbs played key minutes on varsity last season, including in the Sectional Championship game against East Chicago Central High School where the Indians fell short 62-67. Hobbs said that the loss left a “bad taste” in the team’s mouth. Now, 364 days later, there’s a new flavor. “It’s the sweetest feeling in the world,” Hobbs said. Lake Central’s starters, Hobbs, three seniors and one junior, played well throughout this tournament. But the Indians wouldn’t have advanced to the Sectional Championship without the help of another sophomore. In the first round game on Wednesday night against Crown Point High School (Crown Point), Lake Central’s Nick Anderson hit a 3-point shot and was fouled on the play, sending him to the free-throw line where he completed a rare 4-point play. That took Lake Central’s lead from eight to 12 points just before halftime. Then, on Friday night, he hit a 3-point, game-winning shot as time expired to defeat Munster High School (Munster). Not a bad couple of days for Anderson, who turned 16 on Friday. 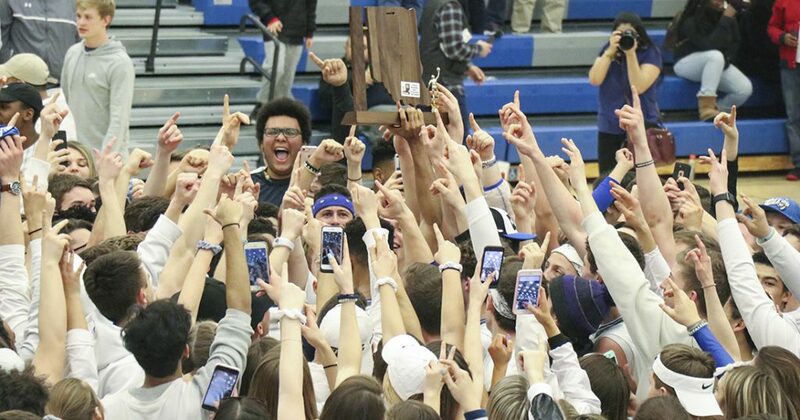 This was the first ever sectional tournament hosted by Lake Central, and the Indians definitely benefited from the home court advantage their fans provided. Lake Central Head Coach Dave Milausnic called the Lake Central fans the best in Northwest Indiana. “Even when we were not playing good basketball, they [the fans] were here.” Milausnic said. On the other side, the Morton Governors weren’t even supposed to be in this game. Their nine regular season wins were the least of the seven teams in the tournament. They’d only won one game in their last five. Just to make it to Saturday night’s championship game, they had to win two sectional playoff games. They pulled it off even though the Governors had won just two sectional games since 2008. Doubling their sectional win total for the last decade was impressive enough. Doing so after trailing in the fourth quarter of both their tournament games was even more incredible. Interim Head Coach Scott Lush heaped praise on his seniors, not just for their performances, but for their ability to keep it all together. They lost a man a lot of them looked up to in Head Coach Robert Hall, who passed away in January after a battle with cancer. In their semi-final game against the East Chicago Cardinals, the seniors carried the mantle. First, Kristopher Mingo hit a big 3-point shot to bring the Governors within one point of the Cardinals. Then Kionne Layne scored a go-ahead shot on the next possession. Morton lost the lead with just 12.2 seconds to go. Mingo’s number was called again. This time, he drove to the basket and threw up a shot that won the game for Morton. “Jesus Christ helped me make that basket,” Mingo said after the game. Even after their loss to Lake Central, they received a round of applause from Governors fans who made the trip. They certainly earned it, after beating the odds for a chance to win their first sectional title since 1976. Lake Central will press on in the 2018 IHSAA High School Boys Basketball Tournament. They will take on 24-0 James Whitcomb Riley High School, usually referred to as South Bend Riley, in a regional semi-final on Saturday afternoon. The winner will advance to face either Valparaiso High School or Elkhart Memorial High School in the Regional Championship game later that same evening.